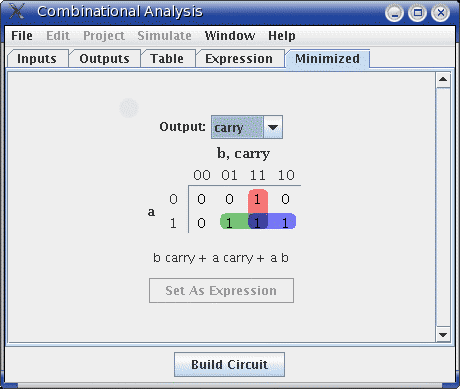 For each output variable, the Combinational Analysis window maintains two structures - the relevant column of the truth table, and a Boolean expression - specifying how each output relates to its input. You can edit either the truth table or the expression; the other will automatically change as necessary to keep them consistent. As we will see on the next page, the Boolean expressions are particularly useful because the Combinational Analysis window will use these when told to build a circuit corresponding to the current state. You can view and edit the expressions using the window's last two tabs, the Expression tab and the Minimized tab. The Expression tab allows you to view and edit the current expression associated with each output variable. You can select the output expression you want to view and edit using the selector labeled "Output:" at the pane's top. Just below the selector will appear the expression formatted in a particularly common notation, where an OR is represented as addition, an AND is represented as multiplication, and a NOT is denoted with a bar above the portion affected by the NOT. The text pane below this displays the same information in ASCII form. Here, a NOT is represented with a tilde ('~'). You can edit the expression in the text pane and click the Enter button to make it take effect; doing this will also update the truth table to make it correspond. The Clear button clears the text pane, and the Revert button changes the pane back to representing the current expression. Note that your edited expression will be lost if you edit the truth table. In addition to multiplication and addition standing for AND and OR, an expression you type may contain any of C/Java logical operators, as well as simply the words themselves. The following examples are all valid representations of the same expression. You could also mix the operators. 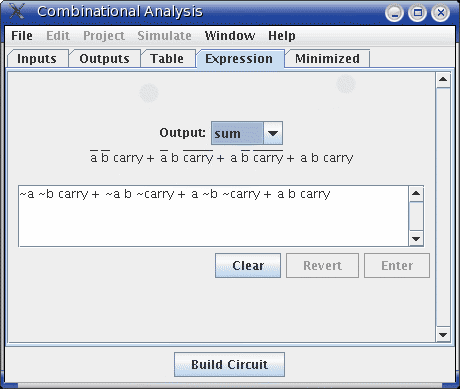 The final tab displays a minimized sum-of-products expression corresponding to a column of the truth table. You can select which output's minimized expression you want to view using the selector at top. If there are four or fewer inputs, a Karnaugh map corresponding to the variable will appear below the selector. You can click the Karnaugh map to change the corresponding truth table values. The Karnaugh map will also display the currently selected terms for the minimized expression as solid semitransparent rounded rectangles. The Set As Expression button allows you to select the minimized expression as the expression corresponding to the variable. This will generally not be necessary, as edits to the truth table result in using the minimized expression for the changed column; but if you enter an expression through the Expression tab, this can be a convenient way to switch to the corresponding minimized expression.